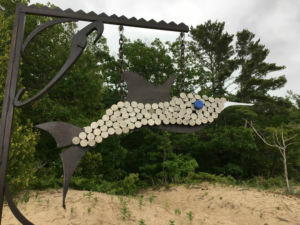 New to Elk Rapids, voted Northern Michigan’s Red Hot Best Teensy Town, is Art Rapids! 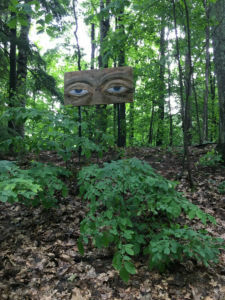 The 15-day art competition, running from June 10 through June 24 (this is the last weekend to visit! ), features 277 works of art in 33 different venues. MyNorth went to check out the new art festival. Here are a few of our favorite pieces! 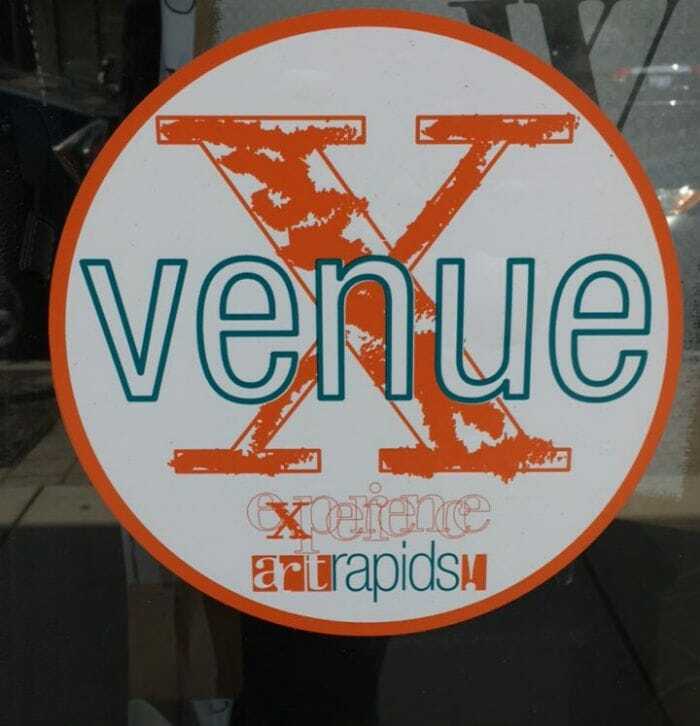 Look for this sticker on Elk Rapids storefronts to see if they are participating in Art Rapids! The easiest place to start is downtown. Grab a map at the information center, located at 115 River Street, or any of the participating Art Rapids! stores. Or just look for the special orange stickers. 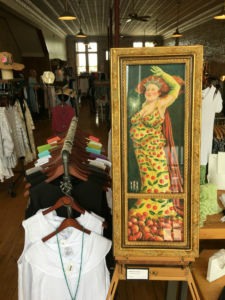 Your family and friends will love spending the day exploring a village full of boutiques, fun eats, friendly people and oodles of art! 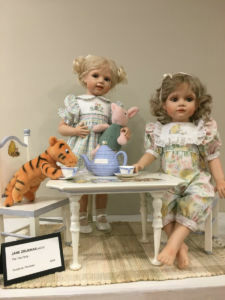 These handmade dolls enjoying a tea party together are at Stoney Cabin Toys. Downtown isn’t the only place to see art. 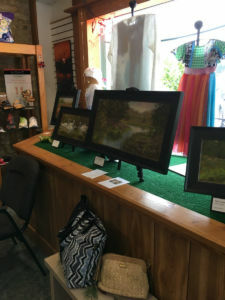 A must-stop is the Up North Center located on US 31 (number #24 on the Art Rapids! map) which has a variety of paintings, sculptures and even a 3D interactive piece. Other non-downtown places include the Village Market, Stone Hedge Gallery and Cone Corral. 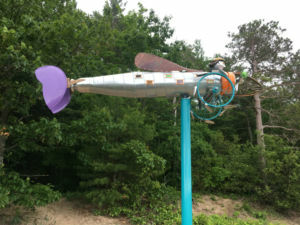 After experiencing all the art Elk Rapids has to offer, cast your vote for your favorite piece. The winner will receive the People’s Choice Award and $2,500! 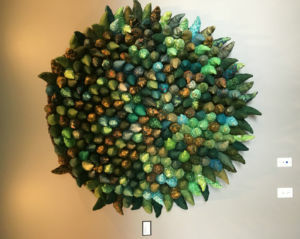 Cast your “People’s Choice” ballot at Twisted Fish Gallery and the Blue Heron Gallery. A separate jury will vote on their top five pieces: $2,500 for Jury’s Best of Show and $250 for second-through-fifth places. 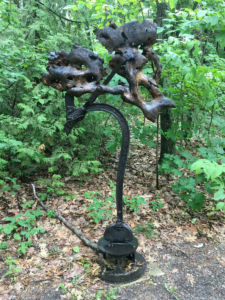 The classic Michigan cherry is featured in this piece downtown at Haystacks. Art Rapids! 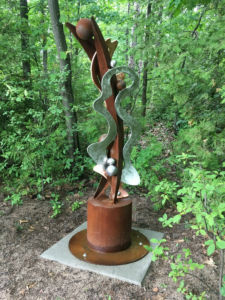 is committed to supporting and strengthening the arts within the Elk Rapids community. Already a huge success, the event is scheduled to be an annual event for many years of artsy awe to come. 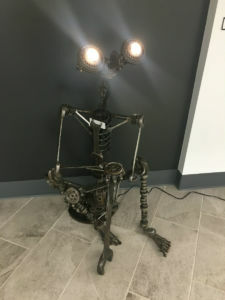 Still want more art? 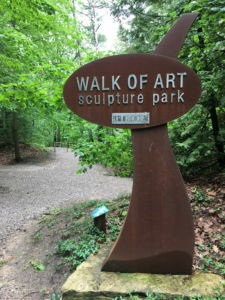 Save your energy for the Walk of Art, located on South Bayshore Drive, just off US 31. 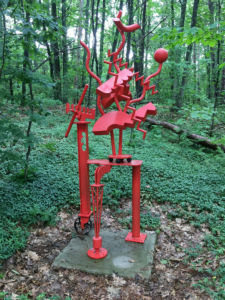 The park is a year-round gallery of 30 sculptures which vary from year to year. 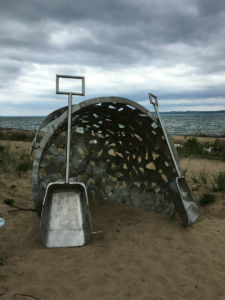 The beautiful trails also include picnic tables, access to the beach, a playground and restrooms. Though pedestrian access is always available, the parking lot closes at 9 p.m. daily. 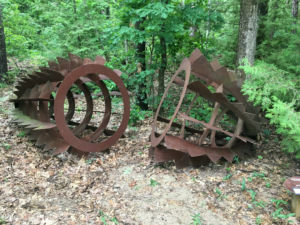 Here are a few pieces along the Walk of Art. 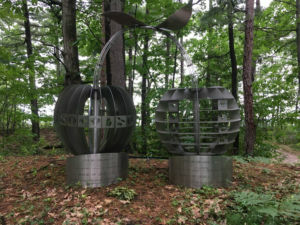 The start of one of the best sculpture parks in Michigan.